The most important part of high-quality cooking is using what is fresh. We happen to have acquired a hefty amount of fresh shitake mushrooms at the farmer’s market this week so, when it came time to make a mushroom risotto we used what we had. Fresh shitakes are much less pungent than their dried counterparts but still retain a thick meaty texture. If you do not have fresh shitakes for this recipe we would recommend using what is available to you be it portobello, cremini, porcini, or something fun you found at the local Asian market (these are some of my favorite mushrooms and some day I will figure out their English names). Another alternative is to reconstitute a large quantity of shitake mushrooms in the broth you use for the recipe. This will add a substantial amount of flavor to your liquid, but be warned that the mushrooms may never be as tender as their fresh counterparts. 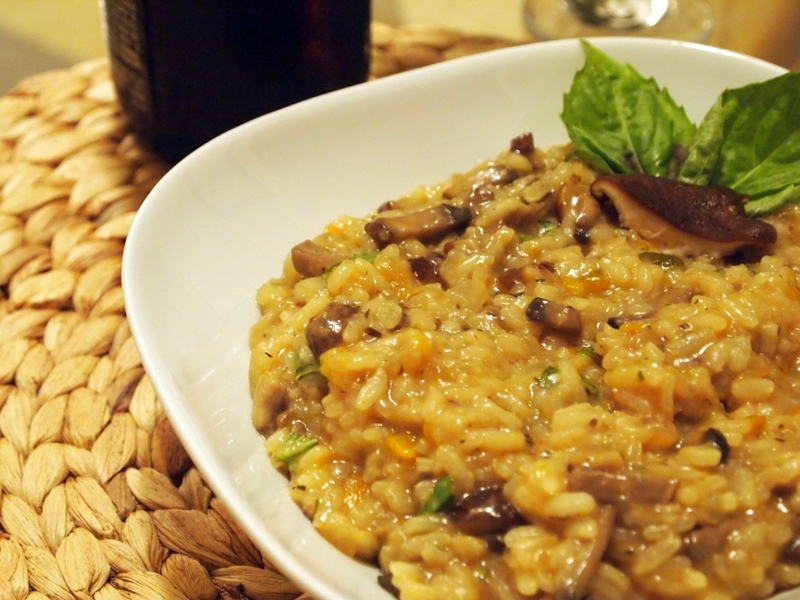 Whatever mushroom route you choose, if you choose risotto you are in for some laborious cooking. The techniques behind risotto are not difficult. What is hard, even for the most dedicated home cook, is not breaking attention on the task at hand. Risotto is meditative work so when the recipe says “stir continuously” it does not mean take a minute to check your email or refresh your cocktail. Keep stirring and a tender, flavorful reward awaits. Heat the vegetable broth and keep it warming on low-heat. In a large pan, heat three tablespoons olive oil and saute the white onion and one of the garlic cloves until the onions are translucent. Add the mushrooms and roasted peppers, and continue to saute until the mushrooms are thoroughly cooked – they should be very soft when finished– about 5 to 8 minutes. Set aside while you cook the rice. In a large pot, saute the shallots over medium-high heat for about two to three minutes in the remaining two tablespoons of olive oil. Add the dry Arborio rice and continue to saute for about 5 minutes. This is to cook the starch on the outside of the rice, which will prevent the finished risotto from becoming just mushy rice. Add the white wine and continue cooking over medium-low heat until all the wine is absorbed. Now comes the laborious part: Ladle about 1 cup of broth into the sauteed rice. Stir continuously as the rice absorbs the liquid. Add another 1 or 2-ladlefuls (about 1/2 cup) of broth, stirring constantly until that liquid is absorbed. Continue to do this until the rice is cooked. This process should take 45 minutes to 1 hour and should use all or nearly all of the broth. Once all of the broth has been absorbed and the rice is cooked (not at all crunchy), add the thyme, rosemary, and cooked mushrooms and peppers. Stir until incorporated and thoroughly warmed. Serve yourself and your friends immediately and enjoy this fantastic dish. Go ahead and have that cocktail now – you’ve earned it!